Spokes Bulletin 121: Cash cut averted? Spokes Bulletin 121 is hitting the doorsteps of all Spokes members, 1200 decision-makers across Scotland [including all Scottish MSPs and all Edinburgh+Lothians councillors] with copies for a further 10,000 other cyclists and interested individuals through bike shops, libraries etc throughout Edinburgh, Lothians and beyond. 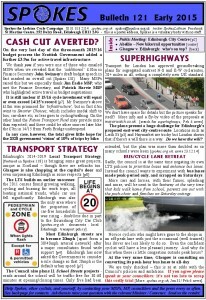 [p1 & p7] Scottish Government cycling cash – campaigning achieves extra £3.9m but total still unclear. Also govt cycling cash 2001-2015. [p8] Glasgow v. Edinburgh – who is most bike-friendly? AND, in all the above … what you can do to help. Also in the printed bulletin [and downloadable on our Bulletin page] is a supplement from Dutch rail company Abellio, the new ScotRail frachisee.